Health Minister Challenged over Wind Turbine Noise and compliance with REDA | Mothers Against Wind Turbines Inc. 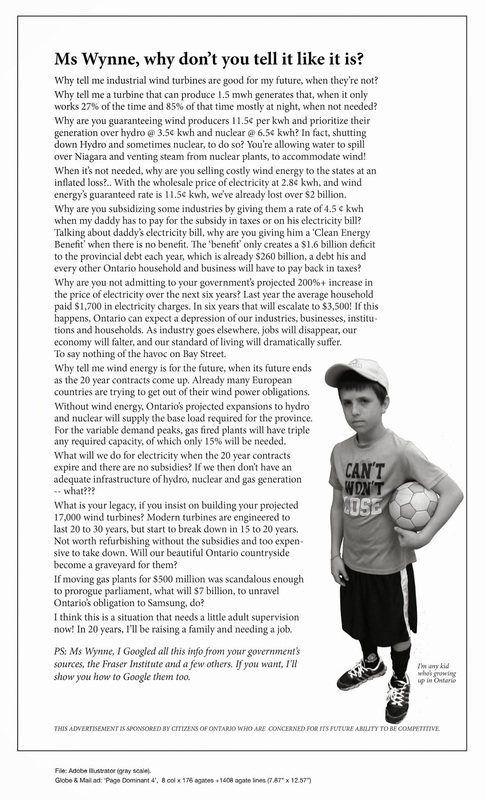 I am pleased to respond to your e-mail of April 12, 2015, regarding wind turbine noise and the authorities outlined in the Radiation Emitting Devices Act, which was forwarded to me on May 1, 2015, by your member of Parliament, Mr. Larry Miller. Health Canada’s role with respect to wind power includes providing advice, upon request, to the federal departments involved in wind turbine projects, as well as to the provinces and territories, on the health impacts of noise from proposed wind turbine projects. The provinces and territories, through the legislation they have enacted, make decisions in relation to installation, placement, sound levels and mitigation measures for wind turbines. As you are aware, Health Canada, in collaboration with Statistics Canada and other external experts, launched a research study in July 2012 to explore the relationship between exposure to sound levels produced from wind turbines and the extent of health effects reported by, and objectively measured in, those living near wind turbines. Health Canada’s Wind Turbine Noise and Health Study was carried out in acknowledgement of health-related complaints from individuals living in close proximityto wind turbines and to support a broader evidence base on which jurisdictions can base decisions as to the placement of turbines. A summary of results of the Study was released on November 6, 2014, on Health Canada’s website at http://www.hc-sc.gc.ca/ewh-semtlnoise-bruit/turbine-eoliennes/ index-eng.php. No evidence was found to support a link between exposure to wind turbine noise and any of the self-reported or measured health indicators examined. However, the Study did demonstrate a relationship between increasing levels of wind turbine noise and annoyance towards several features (including noise, vibration, shadow flicker and the aircraft warning lights on top of the turbines) associated with wind turbines.